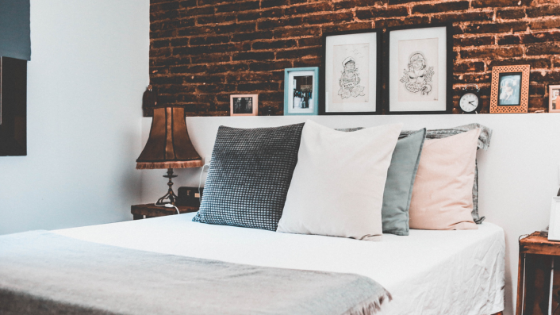 Although the wall color isn’t always something you can change in your Charlotte, North Carolina apartment, you can still add plenty of dramatic color to the bedroom. Neutral-colored bedrooms make the perfect canvas for creating a bedroom that represents your own personal style. Plus, you can have fun with color in your bedroom with a few easy décor items that won’t break the bank. Accent pillows can add a dramatic pop of color to the bedroom without going over budget. Accent pillows in bold colors with dramatic designs will draw in the eye. Although accent pillows are gorgeous statement pieces, avoid the temptation to go overboard with piling them on the bed. Ideally, choose between one and three pillows to add on top of the duvet cover. Coordinate the pillows to match a throw blanket strategically placed at the foot of the bed. Best of all, pillows and throw blankets are very easy to switch out when you’re in the mood for a décor change. Whether you have hardwood floors or carpet, spice up the room with a colorful throw rug. Choose an area rug that includes a contrast color or displays a design that ties into the overall décor theme for your bedroom. For instance, if you have dark wood flooring, choose a white rug. Bedrooms with nature-inspired décor could have an area rug with a floral or woodland design. Plants are underused when decorating bedrooms. Flowers and green plants add color to any room in an apartment, including the bedroom. Crystal vases with red flowers or white vases with greenery are examples of easy pops of color in a room. No green thumb? Not a problem. Choose artificial plants and dust as needed. Create a statement piece by choosing an interesting lamp for your bedroom. Go with a bold color such as red, orange or green, or pick a lamp with a stylish shade. The shade could come in a non-traditional shape or have décor elements like beads or ribbons. Ashford Green, a luxury apartment community in Charlotte, North Carolina, is the ideal place to call home. Contact us today to learn more about our home amenities and view our selection of floor plans.